Hey folks! It has been a while since we have given real signs of life, but it is because we have been very much focused on a couple of events for the beginning of the year! We will write more about that, but we were at the ScreenShake Festival to show our game to other Belgian developers early last month, and this month, we are going to be showing Get Well Soon! at the Made in Asia convention in Brussels! We will be there from Friday to Sunday (March 13th to 15th) with the game at the BIGA (Belgian Independent Game Association) booth. 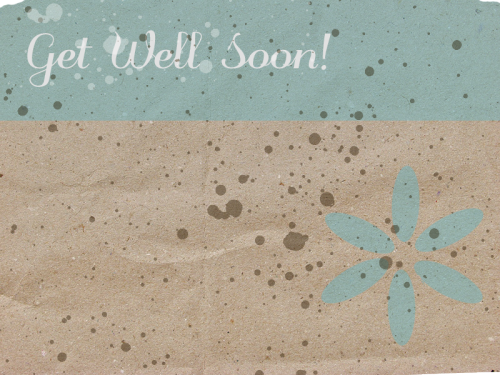 4 comments » | Events, Get Well Soon! 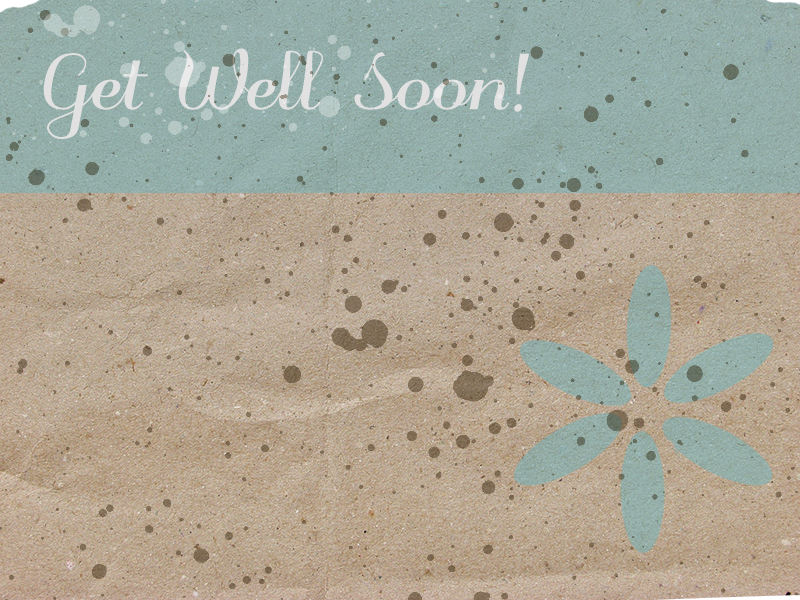 Comment » | Get Well Soon! the discovery of new tools, which we loved! and, of course, our participation to the FrenchCows initiative! Looking behind us, lots of our objectives were reached, despite a great deal of time yet again stolen by our day’s work. We can be proud of ourselves. Let’s roll up our sleeves for 2014! After so many challenges met in 2013 (and some still ongoing), we’ll have to work really hard for what follows! 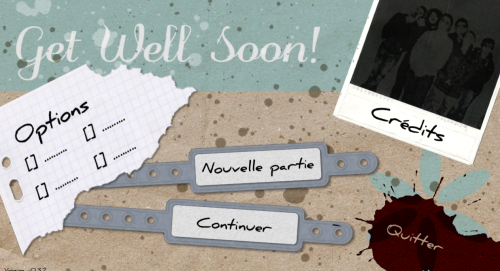 The main objective, of course, is still to finish our first game actually sold online, Get Well Soon!. This past few months, we started to have regular meetings and dedicated workshop-days, which we plan to maintain, as we realized working together motivates us a lot. Because let’s be honest, it’s not always easy to get back home from work to start working again on your own… even if we love it! Once Get Well Soon! will be done, we’ll start a marketing phase, which we are total newbies at. But we hope to learn a lot. Then… we’ll still have LOADS of projects waiting for us to work on! 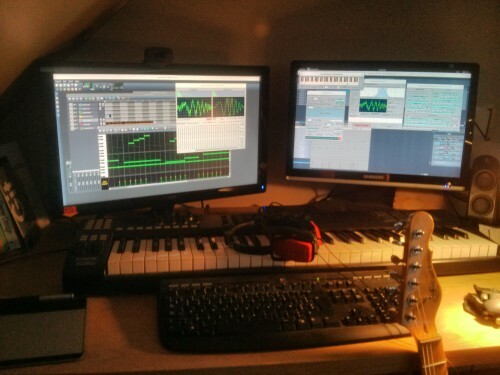 Instead of participating to this December’s Ludum Dare, GSM Productions dedicated the weekend to Get Well Soon!. We had the help of Dimitri, 3D specialist and good friend of the team. Friends making a video game ?!? After trying different types of industries, like advertising, movies or entertainment, I HAD to try that new challenge ! Eyes looking more and more like screens as the hours go by, orgies of junk food, lack of sleep and cheap humor … gosh, how I missed all these ! And what a pleasure to bring my contribution to Get Well Soon! And we did achieve a lot through the weekend! You’ll note that the first level design is finished and the outside environment well advanced! The doors and windows are in place as well as the outdoors stairs. Textures have been done (not all definitive, but we’re working on it). Lots of objects have been modeled (and there are still many more). From a more practical point of view, the mouse’s cursor is now hidden in-game and the main menu is completely over with, with the possibility to go back to it and then resume the game. 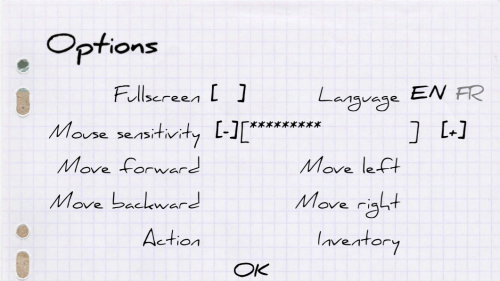 The options now allow you to choose your keys and to determine the cursor’s sensitivity. Since we publish each week an updated version on FrenchCows (we will never encourage you enough to join this friendly community), the version’s number is now visible in the main menu. And, to French-speakers’ delight, you can now choose your language! Finally, talking about gameplay, the character cannot jump anymore and is carrying a torch. Moreover, the turn-based movement is back, a bit modified to match its application to the scenario… and monsters can open the doors. After the success of Get Well Soon! on Ludum Dare 27, we decided to continue to work on this game. Our objective : to offer a second version by the end of the year. Soon after, we stumbled upon the FrenchCows team who were looking for game developers willing to include their game in a pack, but also to get involved into a community and develop additional contents during three months. Their scope and ours being so alike, we took the opportunity right away! So here we are, three months after LD27, with our first game available online! This French initiative sells indie games packs, but not only. The point is to bring together gamers and developers and to make the game evolve during the whole pack’s duration, which is three months. Thus the game included at the beginning of the pack won’t be the same than the game offered at the end. And that’s especially thank to the players’ reviews! This asks a big investment from us, but it’s also a source of motivation! If you want more information, go over here! And, even better, if you want to buy our pack (we won’t stop bringing it ;p), that’s over here! A second version, alright, but what about it? We will refine our game, but why not go further than that? We decided to create even bigger levels and we well intend to put this additional space to good use! We are first concentrating on design, before starting to texture. 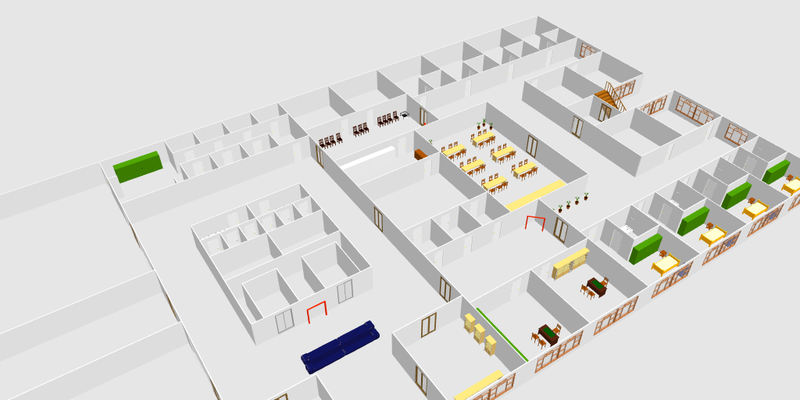 Some objects created during LD27 must be revamped, others were added on the to-do list since we have additional rooms. Meanwhile, we’re working on the levels’ re-design, based on the map and on additional functionalities, like sliding doors… which – wait for it – actually open when you get near! Then, of course, we’ll have to rethink the monster’s design. As for everything else, we have two objectives in mind here : add new functionalities and improve what is already there. 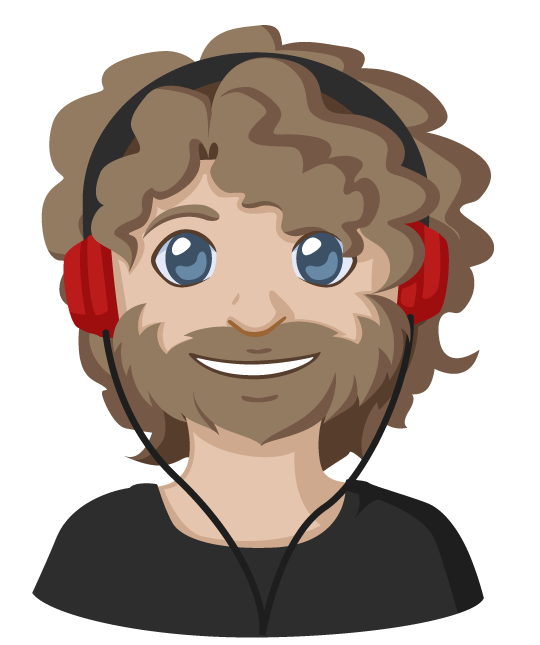 Since FrenchCows, the diffusion platform with which we’re working, is French, we started by implementing translation management to make the game multilingual. Each message was linked to a code. When the message must be shown on the screen, the game send the code to the translation module which translates it into a message in the language chosen by the user. We only translated everything into French until now, but if necessary, this translation module could handle more languages! Furthermore, as previously said, the doors module was corrected. 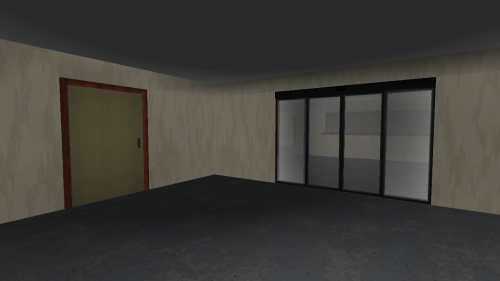 We added a new set of doors: the sliding doors. Consequently, a door can now open because of the players’ action (for example, click on “space” to open the door) or when he comes near it (since sliding doors are automatic). Moreover, the opening system is different between classic doors (rotation) and automatic doors (sliding). Last but not least, we worked on the menu. The fullscreen option is now working, as well as the “back” button which was bugged in the LD27 version. A language selection screen has been integrated to complement the language module asking to choose a language the first time you launch the game. The game also saves the player’s controls options, for those who like to customize them. The mouse’s sensibility can also be changed but this parameter isn’t implemented in the actual gameplay yet. The main menu design has also been reviewed and improved! Since GSM Productions was created, we could (and had to) get used to many tools. We thought it might be interesting to present those we’re currently using. Who knows? Some of you might find it useful! Later on, we plan on sharing a more detailed post on each of those tools, but in the meantime, here is a quick introduction. Any developer would tell you it’s fundamental to use a sources management system. Those tools are meant to preserve a history of all changes done to the code so you can go back if there’s any problem, and to manage simultaneous development and the conflicts those can provoke. Among all the available tools, we choose Git. 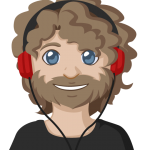 Git is quick and flexible and we’ve learned to use its strength thanks to Git-flow, a workflow proposed by Vincent Driessen. Without getting too technical, Git and Git-flow keep troubles away and allows us to work on (and keep calm) with a free mind! 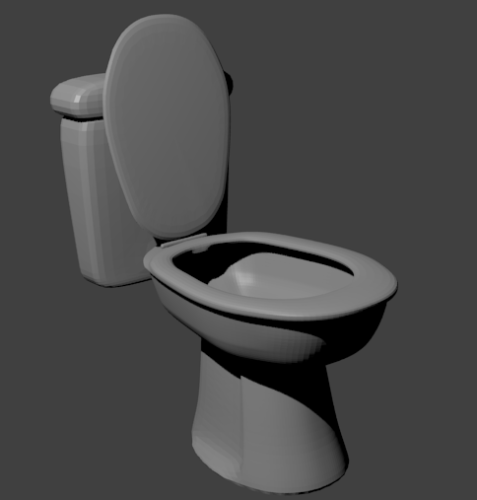 A recurrent element of our history is the use of Blender. This 3D software is powerful and also the one the majority of GSM Productions’ members are the most used to, especially after following two years of training. Since the start, the opening, the way it is easily interfaced with most 3D engine as well as its functionalities made it an obvious choice for the team. After some time (and some discussion, since our two developers are convinced linuxians), Unity3D was adopted as game engine by GSM Productions. For a team like ours, it’s in the end a natural choice, since even the free version of the software allow us to make our ideas come to life. Also, it’s the most robust engine we’ve worked with until today. You can now buy Get Well Soon! Today is a special day for our little team. After so much time spent to work on small projects, our fist game is finally out officially! Yes, it’s the same survival horror we developed during Ludum dare 27. 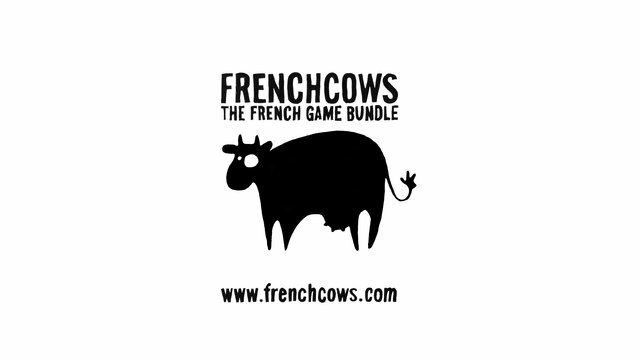 Since then, bugs have been fixed and we associated ourselves with FrenchCows, a new French platform dedicated to indipendent video games, and we’re now part of their first bundle! Thank you to all people who supported us and to all people who will! We’ll be posting updates about next evolutions… until the final release in February! 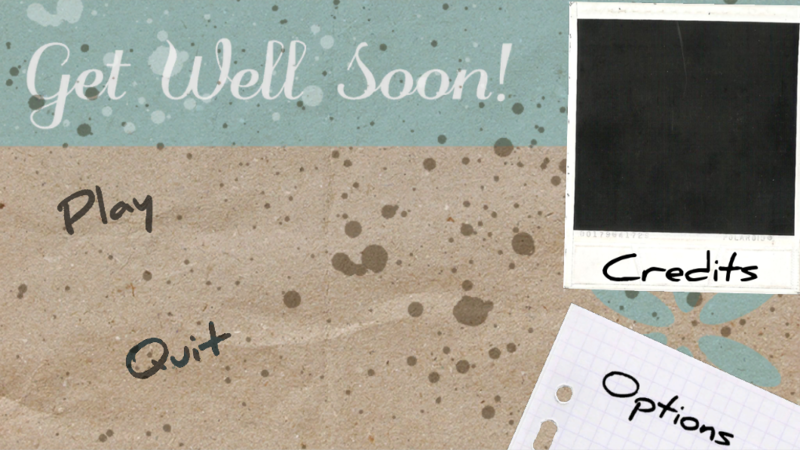 2 comments » | Get Well Soon! This past Ludum Dare, the 27th of its name, was undeniably our biggest success so far, and feels like a milestone for us. The figures speak for themselves… Our result at the end of the post! 60+ comments on LD website! We are happy to say more than 50 people left a review on our submission page from LD27 ! Even though this is partly due to the fact we played and reviewed/rated 100+ games ourselves (among which 20+ the very next day of the LD), it’s still feels amazingly good, and is definitely a big improvement on the amount of feedback we got on our previous entries. Moreover, people thanked us for having thought about AZERTY keyboards (since I tried several game without success because they only worked on QWERTY, I can only agree), and a big plus was certainly Unity 3D allowing us to propose the game on Linux, Mac and PC (and a web version later). 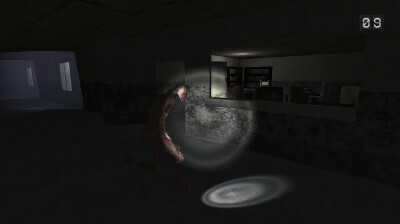 However, the big successes of our game are that it is regarded as scary (it has been compared to Silent Hill, to Slenderman, which is somewhat of a hyperbole, but flattering nonetheless), that it has a strong introduction, particularly through the addition of good voice acting and, for most reviewers, that the idea of a turn-based survival horror feels fresh. And of course there were many, many others, all of them read and appreciated by everyone on the team. Thank you all for playing! We also stumbled upon people playing Get Well Soon and recording themselves. It was thrilling to hear players react to the game as they were experiencing it! And this one is a longer let’s play which goes into much more detail, by someone apparently not taking part in the Ludum Dare. Awesome! Thank you very much kind sir for thinking so highly of Get Well Soon! So we’re 27e on 776, and in top 5 for the mood! And even though we didn’t end up as high for Graphics, our rating is still above 4/5. Sounds, music as much as voice acting, certainly played their role in our results: we are in top 20 for those! We feel a bit euphoric for having done such a finished game during LD and for seeing it so well received! But what that means is that the road is still ahead of us. For the first time, we feel like we have something really worth polishing and extending into a proper game. All the support we got is only serving to boost our resolve to come back before the next Ludum Dare with a new and improved Get Well Soon to conclude this happy episode in the best way possible! Get Well Soon!, our entry for LD27, is then a game base on the mood: music, sounds, designs, we did everything we could to create an oppressing atmosphere… And it’s entirely 3D! A descent into hell where you will have to avoid silent monsters… But be careful, you can only move for a much as ten seconds until… their turn comes. Let’s play: beware: spoilers! If you want to learn more about the game by yourself, don’t watch the video! All in all, the game far exceeded our hopes by matching the idea we had of it. Usually, we end the Ludum Dare with that strange sentiment that yes, it is awesome that you made a game, but how great would it have been to add this or that… Here, we are fully satisfied with the result, and the comments we are currently getting (thanks for playing everyone!) seem to confirm that. And this feeling, no matter the final placement of our little game, is something priceless. We feel proud of having played to our strengths and to have come out of top, for the first time really. As a team, we think it shows that we are maturing, and starting to know how to work together better. Hopefully to your enjoyment! This lack of progress is also partly due to the Ludum Dare. Even if the event only lasts three days, there’s a lot to organize which makes it time-consumming. After the Ludum Dare, we also thought we might perhaps switch Bloboy’s Journey on Unity 3D, but we still have to discuss this with the whole team.